It’s always a pleasure working with our first time builders and educating each potential customer about the steel building process. After all, that’s why we’re here! But we’re always pleased by the positive response we get when a steel building expert decides to build and grow with us. Construction professionals have a keen eye for quality, and tend to accept only the cream of the crop when it comes to buying a building, especially when it’s for their own company. Darr Equipment, a local contracting firm in Illinois, wanted a quality steel building, so they contacted Armstrong Steel. Armstrong agreed to draft, design, detail, engineer, and supply an Armstrong Steel pre-engineered metal building for construction in Piasa, Illinois. The project consists of a 60x120x16 Armstrong Steel building with a 3:12 roof pitch, interior liner panel, and Armstrong’s premium roof and wall insulation package. Jeff Darr, owner of Darr Equipment, selected Armstrong Steel based on their extremely competitive pricing, pre-galvanized secondary framing, and overall building package. “I decided to go with Armstrong Steel to buy my 60x120x16 Armstrong building with galvanized secondary framing, interior liner panel, 6" roof and wall insulation, (2) 24x16 overhead doors, (1) 16x14 overhead door, (3) walk doors, and (8) 3x3 windows. Guess what showed up? Exactly that...and on the date they said it would. I am very pleased with Armstrong Steel and would recommend them to anyone," says Jeff Darr. But Jeff’s experience wasn’t perfect in the beginning. "When I was shopping around for a 60x120x16 building, General Steel wound up acting like every company in the industry couldn't be trusted. When I told them I was buying an Armstrong building, they insisted on putting me on the telephone with a Vice President who proceeded to tell me that Armstrong Steel would steal my deposit, not deliver my building, and wind up penalizing me with price increases. I'm glad I didn't let them scare me out of choosing Armstrong Steel. None of these things wound up happening,” said Jeff Darr. “We are seeing less reputable companies spinning manipulative and unfounded attacks, online and over the phone, out of desperation for the sole purpose of distorting a consumer’s perception of Armstrong Steel. Jeff’s experience is a perfect example. Don’t be misled. If you’re purchasing a pre-engineered metal building, we invite you to tour our corporate office in the Denver Tech Center, go over the finer details of your project and work on preliminary drawings with our project managers and detailers. We’ll see to it that your flight and lodging are arranged at our expense because, ultimately, purchasing a building should be a matter of trust. Don’t risk your project on anything less than Armstrong quality,” says Vice President of Sales, Karl Hatfield. Saving people money to help them live better was the goal Armstrong Steel’s founder envisioned when he established Armstrong Steel Corporation. Armstrong Steel continues to deliver that promise to business owners, builders, engineers, developers, corporate purchasing directors, congregations, homeowners and architects. It’s the focus that underlies everything Armstrong does. Armstrong Steel knows that price matters to its customers, whether they live in the United States, Central America, or Canada. That’s why they offer the best quality steel buildings at the lowest prices to all of their clients. 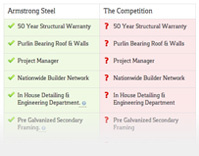 Armstrong Steel also looks at savings that go beyond their steel building prices. For example, they regularly work with their suppliers to introduce more energy efficient products that save customers money for years to come. Armstrong Steel clients keep coming back because they know they will find the lowest prices around on the buildings that match their lifestyle. In the Darr’s case, the building is used to keep all their heavy equipment and machinery safe. “Saving money is a means to helping our customers live better. By offering the best possible prices on the buildings our customer’s need, we can help them afford something a little extra. Saving people money so they can live better is at the heart of everything we do. Simply put, helping people live better is more than something we do, it’s who we are,” says Armstrong Steel’s President, Ethan Chumley. Armstrong Steel also sees opportunities to help people live better beyond the walls of their steel buildings. That is why they support causes that are important to it’s local communities, like education, and why they are working hard to do their part in protecting our planet and conserving natural resources for generations to come. By working closely with communities and suppliers, Armstrong Steel reaches beyond its customers to help improve the lives of builders and contractors around the globe.